In the interview Stephen mentions John Meier’s Marginal Jew, approving the scholar’s vision of an unpapal conclave (Catholic, Protestant, Jew, agnostic) used to get at the historical Jesus. Carlson suggests throwing an evangelical, Unitarian, and atheist into the mix. Right on. Two months after a tantalizing blurb in Publisher’s Weekly, Stephen Carlson offers his own preview of Gospel Hoax with the Table of Contents. I feel like I’m back in the fall of 2003, when bits and pieces of Jackson’s Return of the King were being released slowly, painfully slowly, over the course of four months — teaser trailer on The Two Towers DVD at the end of August, theatrical trailer following in September, and then all the previews and spoilers which could be found on the web to tide us over until the big day in December. Maybe Library Journal will get around to reviewing Stephen’s book for an October teaser. I almost wish I was still a reviewer for LJ; I might have had the privilege of reviewing Gospel Hoax myself. Word is getting around about the new biblioblog in town. Check out Raphael Rodriguez’s Verily Verily. Due to StumbleUpon’s horrendous new censorship policy, I’ve been forced to join it so I can continue reading the R-rated blogs. Up until Friday, the R-rated (though not X-rated) blogs were viewable to non-Stumble users, but no more, apparently because of some legal problems that have arisen across the globe. For those unfamiliar with it, StumbleUpon is a great browsing tool that links you to other users who share similar interests. (It requires the Firefox browser, which is the best anyway.) So I now have a second blog, which isn’t R-rated itself and should thus be viewable to anyone. On the other hand, some of my networked “friends” at StumbleUpon are R-rated, and who knows, this may well end up making me R-rated by default. One of those friends, incidentally, happens to a real-life friend, Matt Bertrand, who has been on the blogroll of The Busybody since day one. So for any readers who have been following Matt’s blog (I have occasionally linked to him in posts), you will now be stonewalled from the review portion of his blog unless you join StumbleUpon. It’s bloody shameful, and I’m glad to see aggressive protests to the new policy. My rant for the day against censorship. UPDATE: (9/26) StumbleUpon has resolved the problem. From now on, non-Stumble viewers who visit R-rated blogs will get a message, “This profile is R-rated. If you are 18 or older, you can view the content on this page by clicking here.” That was easy enough. Psychologist Robert Feldman, from the University of Massachusetts, conducted a sobering study which found that 60% of people tell on average 3 lies for every ten minutes of conversation. The frequency applies to men and women equally, though the sexes tend to lie about different things: men to make themselves look better, women to make others feel good. This has in view all types of lies: socially acceptable lies (normally not considered lies), unacceptable lies (blatant or bald-faced lies), lies of omission (silent lies), and many other forms of deception. 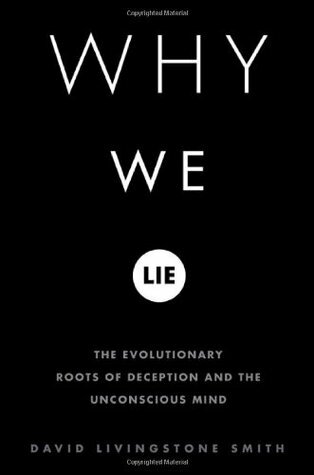 The field of evolutionary psychology is broadly inclusive on the subject, and it’s only beginning to come to terms with the phenomenon of self-deception. Self-deception is seriously underrated — rather understandable, since none of us wants to admit we deceive ourselves (which is part of the self-deceiving process). But lying to ourselves is essential, says Smith, because it soothes the stresses of life, and in the process helps us lie efficiently to others. The unconscious region of the brain, where truth can be effectively obscured, makes this possible. “Lying to ourselves promotes psychological well-being,” states Smith in an online interview. Research shows that depressed people deceive themselves less than those who are mentally healthy. They have a better grasp on reality than most people, and in his book Smith cites the philosopher David Nyberg who remarks that “self-knowledge isn’t all that it’s cracked up to be” (The Varnished Truth, p 85). It would seem that the religion of gnosticism starts from a horribly wrong premise. None of this addresses the morality of lying and deception, only their naturality. The point is that lying and deception are perfectly normal, and necessary for the sake of mental health. But there’s not much way around propriety in a text like II Kings 18:27, where those doomed people sitting on the wall “eat their own dung and drink their own piss”, a text mentioned in Tuesday’s New York Times article, “Almost Before We Spoke, We Swore”. Reporter Natalie Angier notes the prudishness of state legislators (much as Tyler does of bible translators), who are getting ready to consider a bill that will increase the penalty for obscenity on the air if passed. What silliness. Swearing is good for the soul, and someone with a lot of sense once said, “swear if you care”. Translators and legislators seem to care about the wrong things these days. On the Crosstalk mailing list, Andrew Smith notes that Secret Mark is the only (supposed) non-canonical fragment quoted by church fathers which doesn’t contain an actual saying of Jesus. Stephen Carlson suggests this is all the more remarkable given that the Secret Mark fragment is longer than others, with plenty of missed opportunity — no return dialogue from Jesus in response to, “Son of David, have mercy on me”; none explaining the “mystery of the kingdom of God”. “If the non-canonical gospels appear to us as odd ducks,” says Carlson, “Secret Mark is the oddest duck of the lot.” Morton Smith was a rather odd duck, wasn’t he?